Browse our wide range of equipment solutions for pallet repair, sorting, painting and stenciling, grinding, wood recovery and more. Looking for value-added equipment solutions to boost your pallet plant’s bottom line? We are committed to excellence in design and manufacturing, providing the highest quality machinery, software and systems – produced right here at our facility in Jenison, MI. You can trust our team of experts to deliver the automated equipment solutions you need – on time, and on budget. We specialize in equipment and software for pallet manufacturers, recyclers, and timber processing facilities. 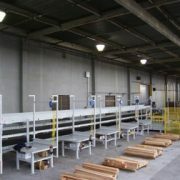 Our product catalog is tailored to the unique demands of the wooden pallet industry. 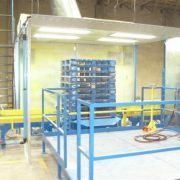 From ergonomic work stations to turnkey pallet repair and sort systems, we’re proud to present the best automated equipment and systems the industry has to offer. Combined with our user-friendly PalMateERP® software suite, our state of the art equipment can transform the way your plant operates and improve your bottom line. 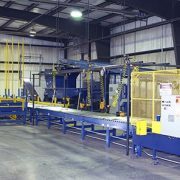 President, C&C Pallet Remanufacturing, Inc.
Why automated equipment and systems by AMS? We manufacture our equipment in-house, allowing us to offer superior service, unsurpassed quality and competitive pricing. Beyond the bottom line, our customer support staff are the best in the business and we provide detailed documentation on all our equipment and software.